The Mars Science Laboratory Curiosity rover ChemCam team have received the first photos from the instrument’s remote micro imager. The successful capture of ChemCam’s first 10 photos sets the stage for the first test bursts of the instrument’s rock-zapping laser in the near future. 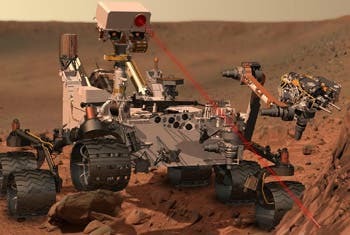 The resultant flash of glowing plasma is viewed by the system’s 4.3-inch aperture telescope, which sends the light down an optical fiber to a spectrometer located in the body of the rover. There the colors of the light from the flash are recorded, enabling scientists to determine the elemental composition of the vaporized material. ChemCam also has a high-resolution camera that provides close-up images of an analyzed location. It can image a human hair from seven feet away. The ChemCam system is designed to capture as many as 14,000 observations throughout the mission. The next tasks for ChemCam—the inaugural laser burst and spectral reading—will help scientists determine the integrity of the ChemCam system and the pointing capability of the rover’s mast, which supports ChemCam’s laser and telescope.